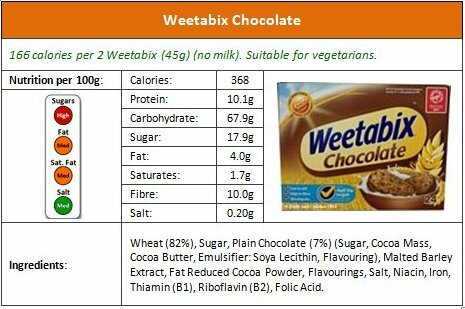 Diets and Calories: How Healthy Are Your Weetabix? 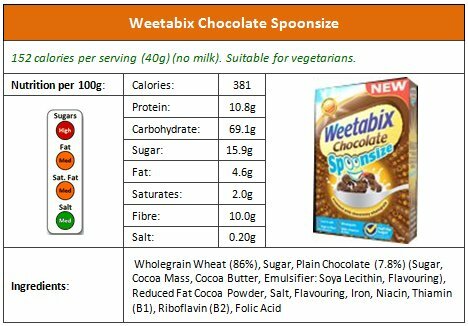 UPDATE 2018: As this post is now a few years old, I've updated the Weetabix range in my new post. 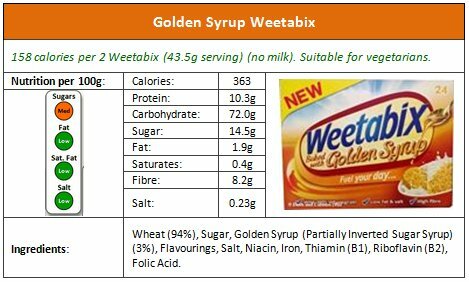 Weetabix Range, Nutrition, Calories and Ingredients. 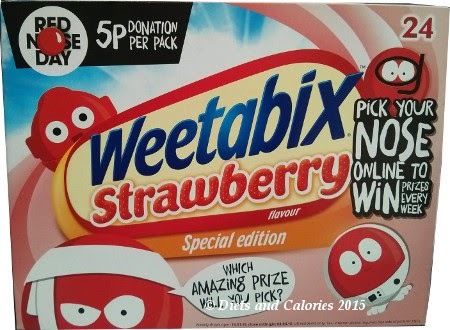 Weetabix are one of the most popular breakfast cereals which many of us have been enjoying for years. 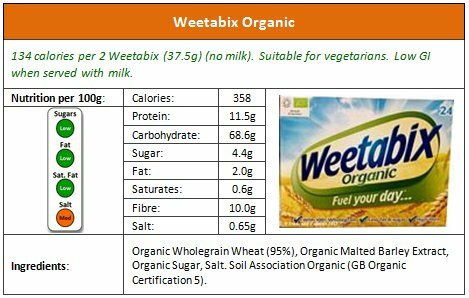 Made from whole wheat, Weetabix are high in fibre and low in fat, sugar and salt. Plus, when eaten with milk, they have a low Glycaemic Index (GI) level, providing slow release energy throughout the morning. 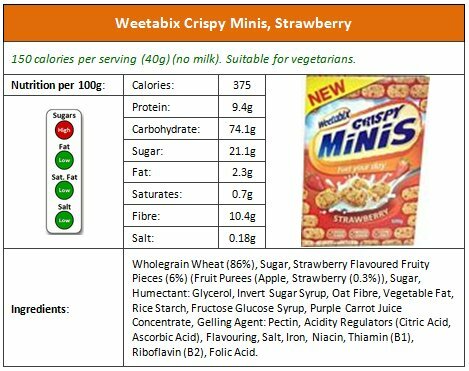 But with many more Weetabix varieties to choose from these days, are all Weetabix breakfast cereals still healthy? 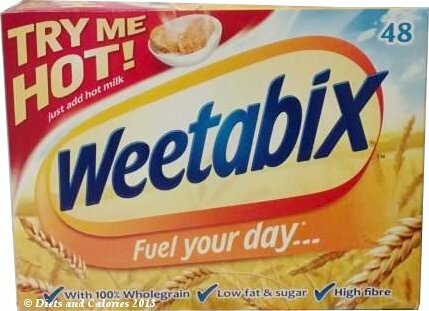 There are many ways of eating your Weetabix, but no doubt the most common way is simply by adding hot or cold milk and maybe topped with fruit. 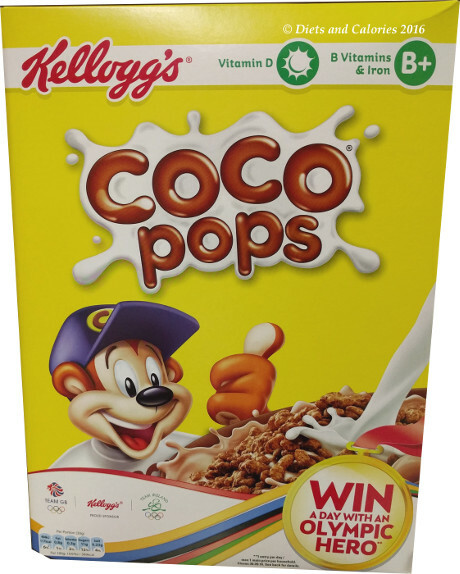 Some of the newer varieties have added ingredients such as strawberries and fruit or nuts, making them a little more flavoursome and sweeter, but inevitably higher in sugar. 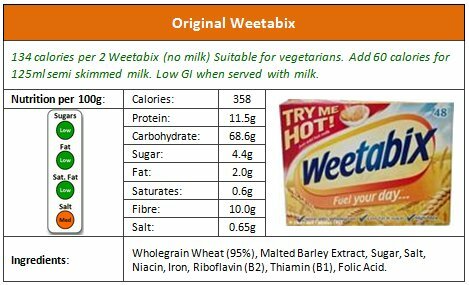 To help you see the individual nutrition in the Weetabix varieties currently on sale in UK stores, I've compiled the following tables including calories, nutrition and ingredients and a traffic light symbol for each variety. By looking at the traffic light, you can see whether the fat, saturated fat, sugar and salt levels are within healthy levels. This can be useful if you have particular health concerns, such as whether you're on a low salt diet, cutting down on fat or sugar, or looking for the lowest calorie cereal. All calories are shown for the dry products. 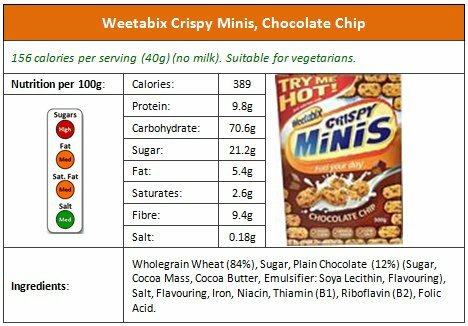 For 125ml of whole milk add an extra 80 calories, for semi skimmed milk add 60 calories, for 1% fat milk add 54 calories and for skimmed (fat free) milk add 42 calories. 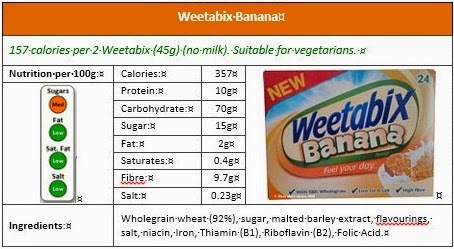 151 calories per 2 Weetabix (no milk) Suitable for vegetarians. Add 60 calories for 125ml semi skimmed milk. Low GI when served with milk. 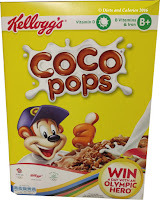 Wholegrain Wheat (90%), Sugar, Malted Barley Extract, Flavourings, Salt, Niacin, Iron, Thiamin (B1), Riboflavin (B2), Folic Acid. 156 calories per serving (40g) (no milk). Suitable for vegetarians. 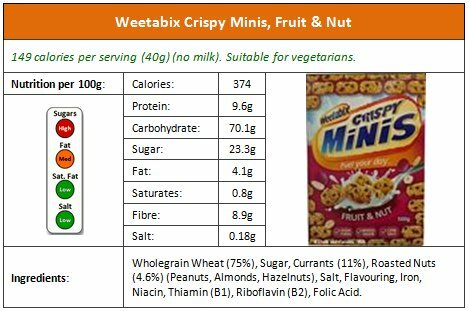 Wholegrain Wheat (83%), Sugar, Sweetened Banana Chips (9%) (Banana, coconut oil, sugar, flavouring), Flavouring, Salt, Iron, Niacin, Thiamin (B1), Riboflavin (B2), Folic Acid. 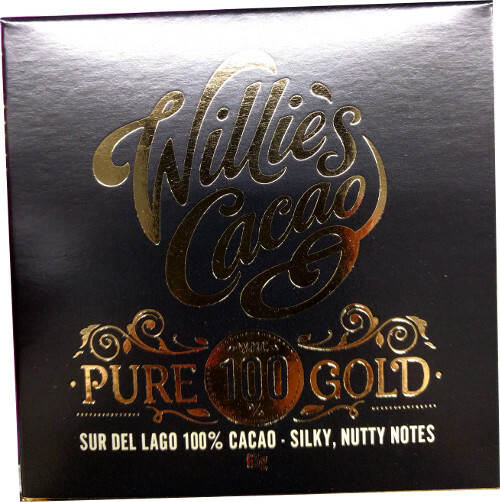 150 calories per serving (40g) (no milk). Suitable for vegetarians. 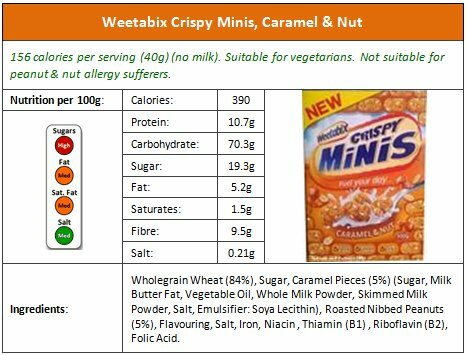 Wholegrain Wheat (88%), Sugar, Blended honey (1.5%), Molasses, Salt, Flavouring, Iron, Niacin, Thiamin (B1), Riboflavin (B2), Folic Acid. 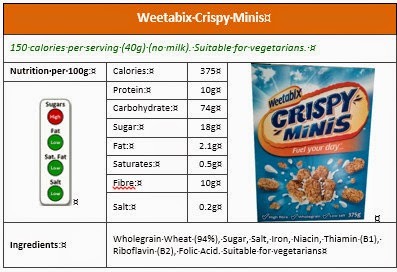 Note: The cereals shown here don't include other Weetabix branded cereals, such as Oatibix or Readybrek. 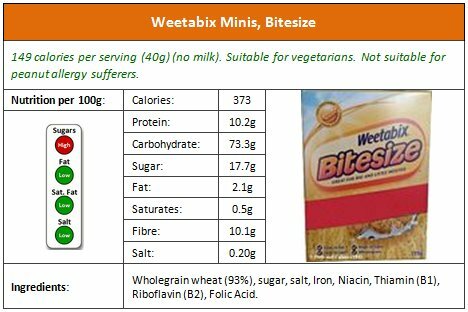 For overall and individual nutrition and calorie comparisons for Weetabix, see Weetabix comparison guides according to nutritional values. Wow i found this really helpful. Great question! If you're trying to diet, stay away from all with high or medium sugar levels. So I'd only go for the first two - Weetabix and Weetabix Organic.